The 2011 ivory and gold CVO Road Glide Ultra cuts through the air softly, as though in stealth mode. Its rider, Doug Ramstad, also has been in mostly stealth mode during the years he’s been a HOG member. But more recently, Doug has been involved. He overnighted at Grizzly Bear for the Memorial Day overnighter, and rode the loop with fellow riders Zookeeper, Flounder, Birdie, Maria and Peppermint. It was the longest ride he’d done over a three-day period. And still, he has not yet been run off. He has returned to help with the rally talent committee, and to volunteer at the party in mid-June at the House of Harley. It appears that Doug has come of age, has reached the conclusion that HOG is a good group to be a part of, a special family that’s worth that rare something that only comes with owning a Harley-Davidson motorcycle. Who is Doug Ramstad? He’s the tall guy wearing the black leathers. But there are some things that set him apart from all the other guys wearing black leathers. Doug hails from Sioux Falls, South Dakota. He grew up on a farm, which is where he learned to ride a Cushman scooter at the age of 9. He said he has only crashed one time. That was on that Cushman scooter and he was still 9 years old. He had ridden a bit and thought he was good enough to go fast. He wasn’t. He went through some dried up mud holes and that scooter threw him. He landed head first between the blades of a plow. Luckily he sustained only a broken foot and learned a valuable lesson – to respect motorcycles. After that he didn’t have a bike of his own for a long time. But he partnered up with a friend who had a Triumph 500. Doug’s friend spent the summer teaching Doug to race it. But he never got to race. The day of the first race he was going to run, it got rained out. And that was the end of that as his family moved to Alaska. Doug continued his growing years and decided to go to college, went to the administration and registered. By the middle of the first semester the administration realized he wasn’t qualified and wasn’t supposed to be there. But they gave Doug a conditional acceptance since he had a great grade point average. In Doug’s senior college year he was an intern for a fuel storage tank manufacturing and steel fabrication company where he worked as a draftsman, in sales, on quality control, as a project manager and anything else they needed him to do. The company wanted him to leave college and offered him a good wage. So he took the money and ran with it. That was probably a good thing as he has not one child, but five girls and a boy, with most of them living in Alaska. He also now has seven grandchildren. Doug was in his mid-30s before he rode again, going nearly 20 years without a bike. In those 20 years, Doug was a welder, a hairdresser and then a college student, going back to complete college and study engineering. He finally got a full-size motorcycle, a 900 cc, 3-cylinder forgettable-name bike. He and his family were living out of state at the time, in the year 2002. But the lure of Alaska was deep in his heart and soul, and in 2003 he decided to move home, and sold off everything to get here. The bike whose name could not be remembered wouldn’t fit in the truck, so it, too, was sold. 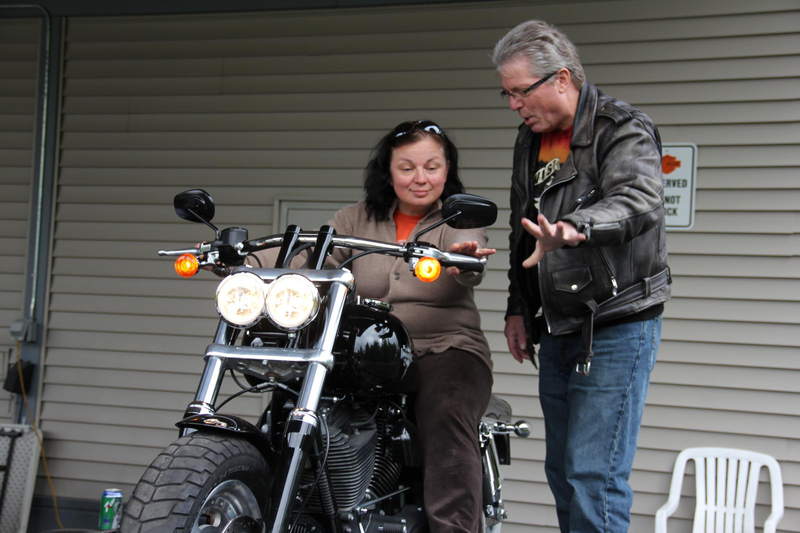 Doug bought another motorcycle in the spring of 2004, this time a Yamaha V-Star, but only kept it for one season. Before he knew it, he had, and still has, a 2005 Softail Deuce, Limited Edition, Number 42 of 200. It was a gift from Santa in December 2004, and has the distinction of being the first bike sold out of the Denali shop in Wasilla. The Deuce sits in his garage while he rides the CVO, but it’s in pristine condition, shiney, beautiful and ready to ride anytime Doug needs to blow some cobwebs out of his head. It looks fast, mean and ready to hit the road at full speed. Doug currently works at ARCTEC Alaska, which is part of Alaska Radar Systems. He is a computer-aided drafting and design technician. Doug is married to Natasha, who is originally from Siberia. 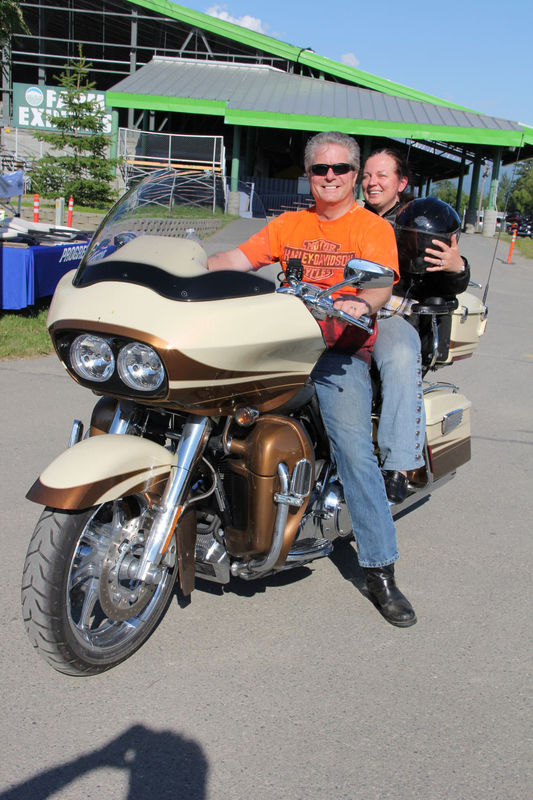 Natasha rides with Doug on occasion, and has helped with the rally talent committee. Between them there have come some good ideas, as well as a lot of support for the group. As we were finishing up the interview, Doug was reminded of a story of his long-term relationship with Barry and the House of Harley-Davidson. Doug remembers Barry’s shop located at the corner of 36th and Spenard. The shop looked like an old gas station, without the pumps, but retaining the service bays. Doug bought a box of parts from Barry as he wanted to build a chopper. Just so you know, Doug never did say if that bike ran.